Another game at the Centre on Saturday night between two teams that had nothing to lose as their playoff positions and opponents were already known. But a Spartans Titans game this year have been all very close games and this game was no exception. The final outcome was 6-3 Titans. But the highlight of the evening was the jersey retiring of Titans captain Dayton Murray in a pre game ceremony. On hand for this special evening were Dayton’s parent Lori and Shawn as well well as older brother Ryder, whose jersey has already been raised to the rafters a couple years ago. And in an appropriate manner at the 33 second mark of the first period on the Titans first shot, Dayton Murray scores his 20th of the season. Nikita SIdenko gave the home squad a 2-0 lead midway into the period. The Spartans replied about 5 minutes later to send the teams to intermission with the Titans holding a 2-1 lead. The second period saw the Titans score twice to the Spartans lone goal to head into the final period of the regular season with a 4-2 lead. Filippo Guaita and Joakim Braneby with his 40th of the season were the goal scorers. In the final 20 minutes, the Titans scored twice to lead 6-2 as Colten Smith and Bailey Chenier registered goals. A single reply by Almaguin and that was it for the scoring as the Titans registered their 27th win of the season. Axel Hallor collected a pair of assists. Tim Cachard got the win. Shots on goal were 54-38 Titans. 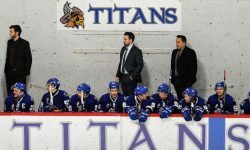 The Titans will now start the playoffs at home on Friday February 22nd against the West Nipissing Lynx, game #1 will be an 8pm start. Game #2 will be the following night Saturday February 23rd in Sturgeon Falls with a 7:30pm puck drop. If required game #3 will be back at the Centre Monday February 24th at 7pm.